Salvation And Survival: Is This How Noah Felt? Is This How Noah Felt? Do you ever have those days when you think you could perfectly identify with Noah? I mean, you may not have experienced the personal conversation with God that Noah enjoyed -- I know I certainly haven't. (Although I would like to -- I think it might make things a whole lot clearer!) But perhaps, like me, you have that Spiritual sense that has been talking to your soul for a few years now. It's telling you that things aren't exactly headed in a good direction, and that maybe we should be getting ready for something big; something that's going to rock our world. Did his friends, relatives and fellow citizens look at him like he was crazy? Did they think he was over-reacting? After all, since he had first sounded the alarm, life on earth had pretty much continued "status quo". Their normalcy bias was alive and well. "Look, Noah, while you've been hoarding food and battening down the hatches, we've grown more prosperous and enjoyed life! When are you going to give up all this doomsday talk? Look! Nothing's going to change!" I know I'm just imagining that conversation taking place, but I can certainly identify with it. While PLW and I saw a flattening of the economy which affected our business, friends were taking vacations to Europe. As we have postponed upgrades to our home and property, others are building $3 million second homes in the latest celebrity "hotspot". While we forego indulgent or nonessential purchases in favor of items that will sustain us during a crisis situation, they are buying superficial and shallow objects to avoid staring the monster in the face. This observation does not come out of envy or jealousy; rather a very pointed realization that PLW and I have been set on a very diverse path. At least Noah had a pretty good idea what was coming. We are proceeding out of sheer faith and an uncertainty of what's around the bend. It hasn't been easy, nor much fun, but like Noah, we stay focused on obeying God and continue to walk our often lonely path. Because we don't have a crystal ball to know exactly when the bottom is going to drop out, we just keep putting one foot in front of the other. We just know that we're in a covenant with the One who has Power and Authority over our lives. But because He has also shown His Grace and Mercy to us, we fully trust Him with our lives and our future. Where He leads us, we will follow. Once God brought His judgment upon the earth, Bible scholars speculate that Noah and his family survived on the ark for a little over a year. I have often thought what that must have been like -- cooped up on that floating shelter with all those animals, and living in tight quarters with family members; some of whom may not have completely bought into Noah's divinely-inspired project. What will our lives be like when the SHTF finally happens? What will it be like when God shuts us in our own personal arks during the chaos that is coming? And I oftentimes find myself wondering what life will be like post-crisis, post-collapse, or whatever our point of no return might be. Then, through all those years and prep time of building the ark, did Noah just wish God would bring it on, so he could begin rebuilding the lives of his family? Did he think the process of restoration had to be better than the constant tension and worry of waiting for the shoe to drop? Or because he actually "walked and talked" with God, did he have a closer, more intimate relationship with his Maker, and was given more details about what to expect? Or perhaps he simply chose to believe God and obey His commands: warn your fellow man that judgment is coming and continue with the task I have given you. And because of that steadfast commitment, Noah "found favor with God." All I know is that I take great comfort in Noah's story and his covenant with God. He shows me that I must not question, keep moving forward, and trust that God will protect His faithful. I will continue to advise others to prepare, and above all else, to seek their own personal relationship with God. 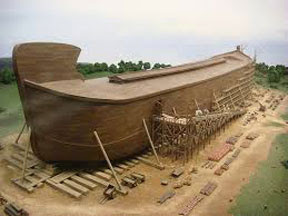 And just like Noah, we can ride out the coming storm and be delivered unto a better day. Hebrews 11:7 "By faith Noah, being warned by God concerning events as yet unseen, in reverent fear constructed an ark for the saving of his household. By this he condemned the world and became an heir of the righteousness that comes by faith." I have these same concerns, especially regarding my family. I don't have enough resources to provide for four grown children their spouses and grandchildren. Only one of my kids gets it. He's the one who was in the navy now living in San Antonio. My daughter-n-law knows how to garden and how to preserve food. I think they will be alright. My other three are clueless. My oldest son is in debt with a brand new truck so he can tow the new boat and the new jetskis. They have no concept of being prepared for anything let alone a major disaster. His wife needs medication for a bi-polar disorder and can't function without it. But they only have enough for today. They won't listen. They believe nothing is ever going to happen not here, not in the US. My other two kids pretty much feel the same way. As long as they have their jobs everything is OK.
As a parent I will continue to pray for them asking God to break through their stubbornness before it's too late. You are not alone! Each one of us would love for all of our family members to get on board, and it is tough to worry about them. Just keep doing what you are doing --- praying for them is the best thing you can do. At this point, God is the only One who can reach them, and we must trust Him with their lives and their futures. God Bless! I also feel like the poster above... my kids are nowhere near ready if there was a third world war or nuclear attack... but I keep on praying. I feel so lost sometimes, it's a very lonely world and even in marriage. BUT, with Jesus we are not alone, and He will fight for us. Though we will all go through hard times, we have hope in the unseen, where others have put their hope in their things. I am so glad Jesus apprehended me when He did, and I have not looked back! May the Lord bless you in the coming days ahead... we all need to focus on the One who gives life and takes it away.. we are not to sit in judgment, but to watch the power of God in all situations. He will be victorious, and because He will, so will we! Have a lovely weekend! Well - this is quite timely ! You might want to look at http://arkencounter.com on the www.answersingenesis.org website. It is located near Hebron, KY. Haven't been there yet - a little thing about " distance ". It says a lot. We have to remember that Noah found " favor with GOD " through his obedience. It DOES help our mindset to realize that Noah kept at it for 120 yrs., Abraham for many years also trill their promise was realized. I don't complain about my one week " waits " anymore ! I would love to see this amazing project in Kentucky! And you are correct in that both Noah and Abraham were patient for God's promises. We must remember that God can never lie, so therefore His promise to never leave us or forsake us is something we can count on. When it's time, He will be our ark.